Flash Whack-A-Mole brandable game and source code by Galaxy Graphics. Flash Games licensing and branding. 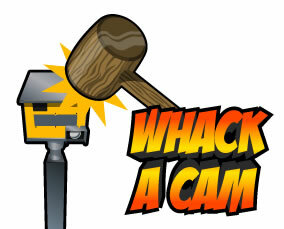 Whack-A-Cam : A Flash "Whack-A-Mole" clone. As a topical subject, speed cameras never go away. As a game concept, Whack-A-Mole is timeless and easily understood so there's no need for any complex instructions to be read before play. The scoring system is on a progressive scale, the better the player does in one game, the harder it gets and the more points they get for a successful hit. With a limited top score and a hidden "accuracy" ratio stored in the hi-score database, this game is ideal for online marketing campaigns where a prize is offered for the best score on the leaderboard. The game and corresponding PHP also include anti-cheat code, making it much harder for the user to fake a top score. Looking for Whack A Mole source code / Actionscript / .fla file ? The source code for this game is also available to buy from Galaxy Graphics. Click here to contact us about Whack-A-Mole Source code.